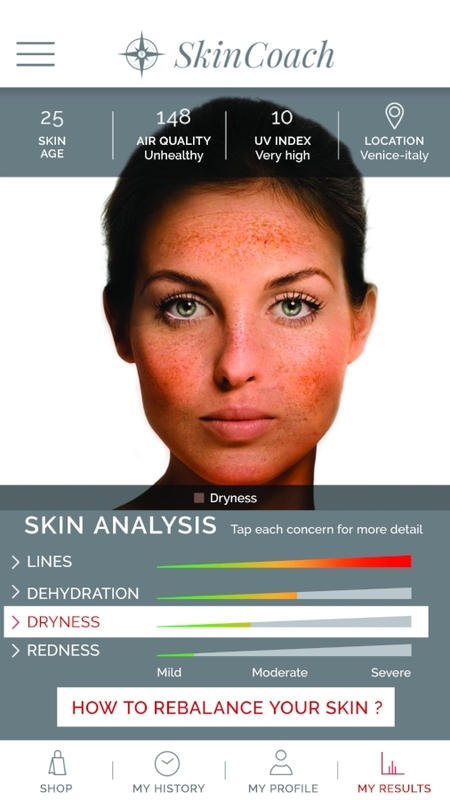 Danish skincare brand True North, created by Jan Behrens, revealed their new My SkinCoach App this week. With Jan’s medical research background, the brand pioneered this technology with the My Skin Navigator back in 2016 to use in their medical centers. However, the power of this skin-scanning technology is now accessible to consumers through the My SkinCoach App. Available on both iOS and Android, Behrens wanted to provide the free tools for skin diagnosis to anyone who wants to use it firmly believing that “a good prescription comes from a good diagnosis”. And with the My SkinCoach App, you can get just that. My SkinCoach takes a photo of your face and within minutes provides you with your skin diagnosis. It measures redness, dehydration, dryness and lines (both fine and deep) and colour maps them onto your photo. Each indicator rates the level of concern on a spectrum between mild and severe, offering reasons why these results may be the case and what you need to avoid. A common response was overuse of glycolic and fruit acids that develop redness. However, Jan was clear that not all skin issues are caused by the products you are using. Hormones, inflammation and other external factors can be the case. The app also provides the air quality and UV index at the user’s current location and gives an assessment of their current skin age. Alongside a diagnosis, users are provided with a prescription on which True North products they should be using to improve their skin health. They can email this prescription to themselves and set up an a My SkinCoach profile to keep track of each skin diagnosis. It’s an interesting way for customers to keep track of how their skin changes (for better or worse) depending on the products they use and lifestyle choices they make. It plays into the growing shift towards personalisation in beauty. My SkinCoach also integrates with biometric system technology, Future Face, that predicts changes to your face over time. The ease of use and detailed diagnosis is sure to grab the curiosity of consumers. However, beyond the app itself, Behrens focuses on finding balance in the skin, not being afraid of natural aging but looking at your “skin age” instead. My SkinCoach follows along the brand’s Lagom ethos of everything in moderation. A large SKU range isn’t necessary and nor is a 10-step routine. The Scandinavian influence is an emerging trend across the future of skincare routines. Speaking with Jan, it’s clear that he has a passion for developing this technology further and harnessing how new research and diagnosis data can benefit R&D. In the future, this technology could utilise data on air pollution, water hardness levels and other lifestyle choices such as diet, outdoor exposure and active levels to further personalise diagnosis. As the brand is aptly named, the My SkinCoach App is all about a skincare journey in the direction of True North that will fuel positive future attitudes towards beauty routines beyond the tools.